November 28, 2010 is the 50th anniversary of the writer Richard Wright's death in Paris. To mark the occasion, Julia Browne, the creator of Walking The Spirit tours of Black Paris, is asking those present in the city on that date to help her to create a collage tribute of photos and mementos. Here I ask her why she feels such a tribute is important, and for more details about the life and work of the man himself. What would you like people in Paris to do on November 28th? 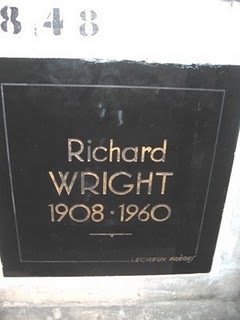 I am inviting people to make a trip to Richard Wright's final resting place at the Père Lachaise cemetery. Take a flower, take a poem, take whatever moves you. You’ll find his black marble marker in the Columbarium near the back of the cemetery. Look for plaque#848, in a corner, under the stairs. People don’t have to wait until the 28th though. In fact, then can go at any time during November. Take a photo of yourself or an impression, and email it back to me at walkthespirit@netscape.net. At the end of the month I will create a collage tribute and publish it (note: I will provide a link to this when it goes live! Adam). 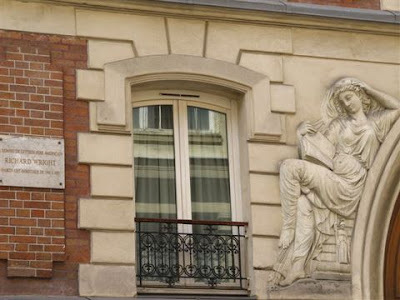 If you can't make it to Pere Lachaise, it will be enough to pause outside his former home at 14 rue Monsieur LePrince in the 6th, or raise a glass at Wright's 'office' Cafe Le Tournon, on rue du Tournon near the Luxembourg Gardens. Send me your photos! Who was Richard Wright and why was he important? Richard Wright was America's first nationally acclaimed and best-selling African-American author. His 1940 groundbreaking novel 'Native Son' shocked the country because of its raw brutality, its straight up depiction of Black male powerlessness and subsequent rage, while at the same time proposing solutions for a more equal society. The book became the first by an African-American as a Book-of-the-Month selection. His work influenced post WWII authors, has been translated into dozens of languages, and continues to be a classic of American literature. In his later writings from Paris, he never hesitated to denounce social and political issues, be they Black, Diaspora or Third World. Why did you want to celebrate this anniversary and how did you get the idea for this original way of doing so? I wanted to celebrate this anniversary because 50 years gone, Wright's work is still relevant today and is still studied in schools at all levels around the world. Even my French mother-in-law read it before I did! I also wanted to make a significant effort to mark the moment because for the past 16 years I have been talking about Richard Wright through my tours. I have repeated his very words so many times as I follow the same streets he did that I often can apply them to my own life; I summarize his challenges and obstacles experiences in such a way that people get a glimpse into Wright's intelligence as he interprets and makes sense of his surroundings, the events swirling around him, the philosophers and celebrities and other expats that colored his life and his work. He is a fascinating role model of a committed life and how choosing exile brings confrontation and revelation to that commitment. I think all expatriates can identify. The idea came to me as I fretted over the fact that I wouldn't be in Paris at the end of November but couldn't, under any circumstances, let the occasion go by without my input. I am in the situation of many Wright fans who are far from his resting place but would like to say some words there, all the same. Although Wright was an American expatriate, he later became a French citizen. Why did he choose to do this? I don’t know the precise reasons but it is certainly linked to the fact that he outright refused to ever return to America with his family because he didn’t want to expose his children to conditions in America he opposed. The birth of his second daughter, in Paris, allowed him to become a naturalized French citizen. He seemed to make a few enemies in his lifetime and his daughter claims that he was murdered. Why was this? Even before he left America, Wright had come under the scrutiny of the FBI. In 1942 certain passages in his book ‘12 Million Black Voices’ provoked J Edgar Hoover to authorize research on Wright and whether his background, writing etc could lead to national sabotage. In Paris, Wright only too pleased that his vision of himself as a responsible, committed writer fit right into the same concept France held of its own writers. He considered himself the conscience and voice of Black America and made it a point to speak out against America’s treatment of Blacks and against racism against American Blacks in Paris. Although the French and European press was eager to interview him, certain American magazines refused to publish his pieces that were critical of America. Also, as an ex-Communist, during the McCarthy period of the 50s, informants were said to be at every café table. In fact, listening devices were allegedly found in his apartment. After his death, his daughter Julia Wright said that The State Department had collected abundant files on his activities. He was a writer who refused to lay his pen down in intimidation. He died while consulting with a new doctor for an ongoing intestinal bug; his regular doctor was unavailable. The official reason given was a heart attack. No autopsy was performed, the name of the doctor and the clinic remain a mystery. His body was cremated shortly after. Where did he live and work in Paris and what traces remain? The Wright family first had an apartment in Neuilly, but from 1948 to 1959 their main residence became 14 Rue Monsieur le Prince, in the 6th district, near Luxembourg Gardens. He also had a farmhouse in the village of Ailly, in Normandy, then took up residence in an arts colony, the Moulin d’Ande, also in Normandy. Besides at home, like many writers he worked in cafes. One of his favorites for quiet writing was known as the Monaco, near the bottom of his street Monsieur-le-Prince. 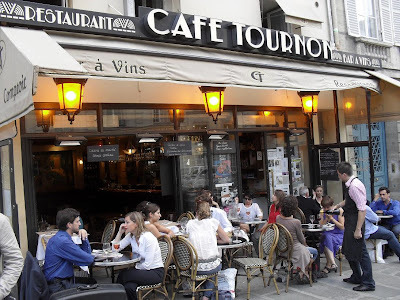 Another, where he socialized was Le Café Tournon – the hub of expatriate life in the 50s. The Tournon is still going strong, of course, as a restaurant and wine bar. They proudly display clippings from their heyday of the 50s which mention Wright and others. An honorary plaque for Richard Wright was dedicated at his Monsieur-le-Prince residence in Februrary 9, 1992 during the African-Americans and Europe Conference. The conference was organized by the late Professor Michel Fabre, (the eminent Wright scholar, author of ‘From Harlem to Paris – Black Writers in Paris 1848-1960, founder of the Centre for African-American Studies at the Sorbonne), and Harvard University. The plaque was the first in Paris honoring an African-American. (The second is for Josephine Baker on Boulevard Edgar Quinet). These venues make up part of your Walk the Spirit tours. Can you tell me a little about this venture, the reasons behind starting it and how it works today? I started doing the tours after taking a class with Professor Michel Fabre in 1992, which opened my whole awareness to this history I knew very little about. I was already deeply interested in literature, history and Paris so incorporating Black history was a natural. With his book, ‘A Street Guide To Black Americans in Paris’, in hand, I started following the footsteps, beginning in my own neighborhood. Imagine my thrill to discover that Langston Hughes had lived mere blocks from me in the 17th! I snuck into the building, past the concierge and up to the sixth floor garret where he had written poetry. I mean, I sure couldn’t have done that anywhere else, and the connection was made. In my excitement I began sharing my findings with friends, who eventually asked me to give them a tour. So, cue cards in hand, that’s how I started in 1994. This was before internet. I used to contact travel agents in the States by snail mail and they’d wonder why on earth anybody would be interested in Black history in Paris. Well, word of mouth and an article in the Wall Street Journal brought interested folks who were just as passionate and thrilled as I. Today, 16 years later, Walking The Spirit Tours offers in-depth walking tours and packages in the Latin Quarter, St.Germain-des-Pres and Lower Montmartre. 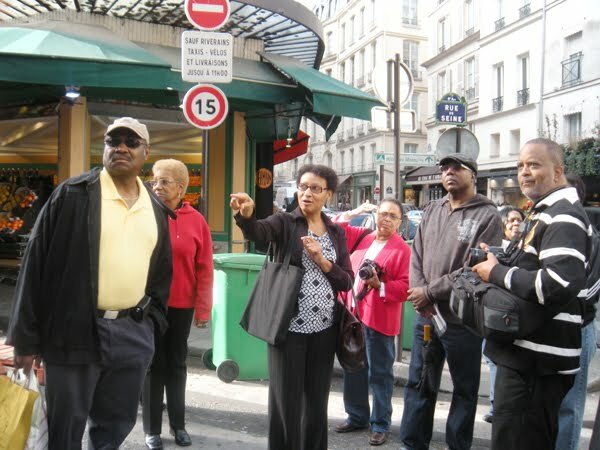 In the past few years we’ve added a very popular Spirit of Black Paris bus tour that allows participants to take in so much more with minimum physical effort, including the Josephine Baker Place. It combines with the walking tour so that people can still get up close and familiar with the vibe of the Latin Quarter neighborhood – its market, shops, bookstores, institutions. I have two guides who live in Paris and who do the tours on a regular basis but I also make the trip several times a year and do tours myself. I just had the privilege of laying out the bus tour route and doing a bus tour for the Toni Morrison Society biennial conference. As head of operations, I also create highly personalized itineraries for groups and individuals – it’s great fun to share my home of the heart. Fascinating Adam, many thanks for this. I wish I'd been aware of it the other day when I was in Père Lachaise, and more precisely, in the Colombarium. I took quite a few photos in there that day, but didn't know to look for Richard Wright. Will have to go back. What a great read, thanks Adam! It really makes me want to take the tour next time I'm in Paris!